I’m always in search of new cocktail recipes – that use what I already have existing in my liquor cabinet. St. Germain, the elderflower liquor, which I normally make in a cocktail with Champagne and soda (http://evewine101.com/2011/11/18/eve-discovers-speed-rack-la-competition/) was crying out for another use. I had all three ingredients below. And, if you know me, I hate sweet drinks, this one had a nice tang of lime to offset the sweet elderflower liquor! Method: Pour all ingredients into an ice-filled shaker and shake well. Strain into a coupe or Martini glass. 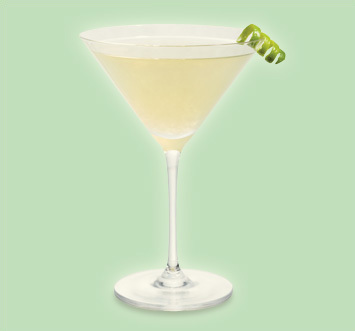 Garnish with a lime twist. Consult your mirror and evince your best gimlet-eyed stare. You never know when you might need it. St-Germain is the first liqueur in the world created in the artisanal French manner from freshly handpicked elderflower blossoms.